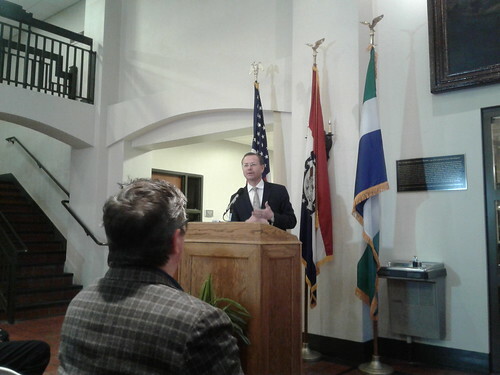 COLUMBIA, Mo 2/21/18 (Beat Byte) -- Columbia Mayor Brian Treece earlier this month introduced a nine member commission that will oversee preparations for the city's 2021 bicentennial celebration. 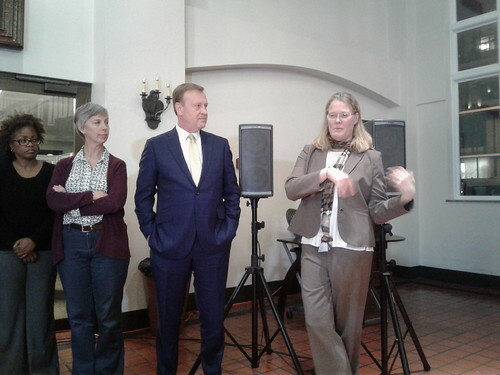 "As much as we have grown, and some would say, grown apart, this bicentennial is a chance for us to come together," Treece told an audience of several dozen people in the City Hall annex, once known as the Daniel Boone Tavern and Hotel. Columbia's founders established not one, but two town squares, Treece explained: at the courthouse and along the Flat Branch Creek, where commerce and a thriving black business community took root. Planned for a section of the Flat Branch long-ago covered by roads and buildings, the "Founders Park" project will uncover the creek at the corner of Providence and Broadway. 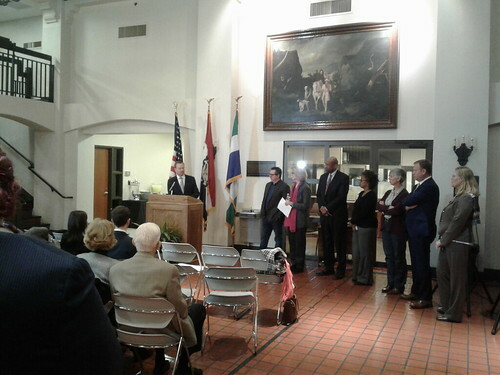 Realtor and former Historic Preservation Commission chairman Brent Gardner will chair the Mayors Bicentennial Commission. Gardner is known in the real estate community for his historic home expertise. His For Sale signs are a common site in the Old Southwest, East Campus, and other historic neighborhoods. Gardner is a longtime champion of restoring Columbia's brick streets, most of which are now covered with asphalt, Treece noted. The bricks, he explained, were used to keep dust down on Columbia's once dirt streets. The new commissioners introduced themselves with brief thanks and in some cases, interesting anecdotes about Columbia history. Current HPC chairperson Pat Fowler spoke about living in a century-old house near Columbia College "that is actually on the banks of the Flat Branch," which is buried beneath her street. Columbia was still segregated when commission member Nate Brown grew up here, he explained. Black residents were "not allowed in this building" when it was a restaurant and hotel. With a broad sweep of his hand, Brown -- the Reynolds Journalism Institute communications director -- recalled his mother's etiquette lessons. When they walked downtown, she would position him in the "proper place for a gentleman" to stroll next to a lady. 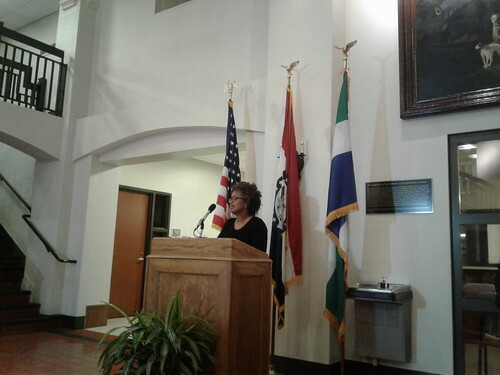 Other commission members Treece named include Douglass High School principal Eryca Neville; Tom Mendenhall, whose family came to Columbia in 1819, later founding the area's largest real estate brokerage, now known as ReMax; Boone County History and Culture Center president Chris Campbell; historic preservation consultant Deb Sheals; Ann Rogers, whose family also has a long Columbia history; and Anne Deaton, whose husband Brady served as Mizzou Chancellor.